Each week there are beautiful flowers on display at All Saints Church, all created by the talented hands of a dedicated group of volunteers. Sue O'Donnell, Ann Ayears, Deb Bailey and Tracy Ward rotate every 2 weeks to add colour, vibrancy and natural beauty to enjoy whilst the church is being used, whether by the congregation, Pilates classes, Little Angels toddler group or the sports club for quizzes. 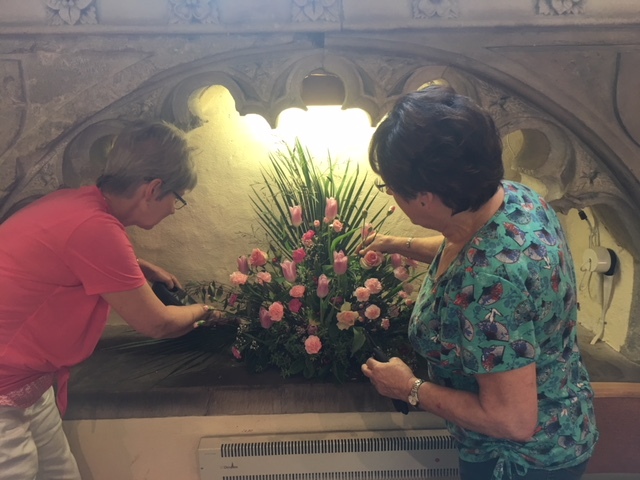 There has been a long evolution of flower arrangers brightening our church, historically Margaret Evans (Court Farm Oast), Sue Day (Tutsham farm), Sue Morelock (Court Lodge), Joyce Morgan and many others too. Sue started when her children were young and they used to help out too. She went to classes, joined Wateringbury Flower Club, learnt from other volunteers and received good advice. 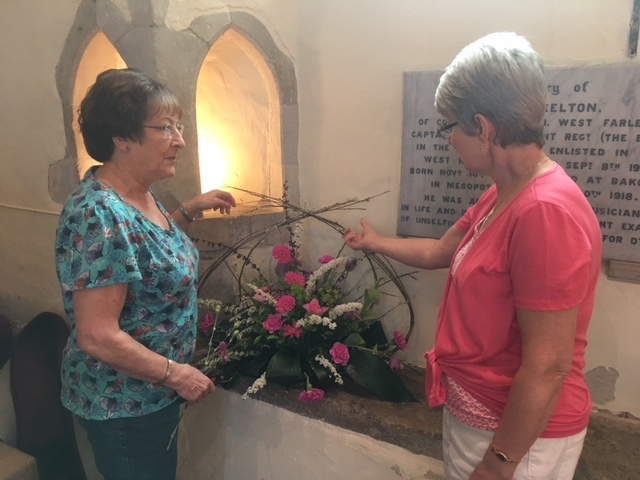 Ann first started after a flower arranging demonstration at The Farleighs WI and they both were able to arrange the church flowers for their children’s weddings. Every week of the year, except for Lent, they fill the church with flowers by either growing the flowers in their own gardens, receiving bouquets from other neighbours gardens or being donated bunches of flowers by people who want to celebrate the memory of a loved one at special times of the year. At Christmas they go to Whittingtons flower wholesaler in Rochester to enhance their displays. They aim not to use dark colours such as purple as these recede against the walls when viewed. They must also ensure that they enhance the collection of Christmas Trees that also decorate the church during Advent whilst leaving room for the choir and congregation! This week they included Tulips, Carnations, Hebe, Heather, Skimmia, Eucalyptus, Palm leaves and Roses, many taken from Ann's own garden on Charlton Lane. The second display included an ornamental willow frame with gerberas creating a beautiful collection of pink and green. They are also keen to hear from anyone interested in helping out with the displays, as ever drop an email to editor@TheFarleighs.co.uk if you would like to know more.